"There were six entrants and although this number is small it is by no means surprising when it is borne in mind that the development of art among the Bantu does not receive much encouragement even in Bantu schools. 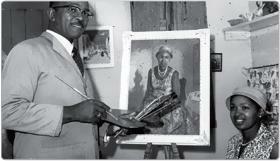 "Professor Winter-Moore and Mrs. Bates, both of the Art School, Rhodes University College, Grahamstown, were the judges. "With the help of a grant from the Bantu Welfare Trust, Mr. Pember [sic] has been receiving training at the Art School, Rhodes University College, Grahamstown."